One of the most requested classes in the world of yoga and especially yin yoga are yin yoga sequences for your hips and hip openers in general. Probably the most important point to start with is that the range of motion in your hips are the result of your unique bone structure and often have nothing to do with tension in your ligaments and muscles. This is referred to as compression. The shape and orientation of your bones actually determine how open you can get in any yoga pose. There are two forms of compression that are important to bring forward when focusing on the hips. That being said, any culture that spends a lot of time in chairs has tight hips. Because we sit in chairs so much in our culture at work, travelling to and from work, during our leisure time, our backs are weak and our hips are tight. Hence the need to open our hips. Our hip joints have shrink wrapped into a small range of motion, especially rotation. The joint capsule of your hip made up of the connective tissue and ligaments holding the hip together have essentially shrink wrapped around the joint. In other words the connective tissue have gotten smaller, shorter and tighter. The hip joint is held in place by the labrum, a special kind of cartilage that forms a rim around the hip socket holding the femur bone in place. The hip joint is a ball and socket joint which allows for a large range of motion. As we discussed in Yoga with Melissa 410, Why We Stress Our Joints, this is known as Contracture, the loss of mobility through a joint. Yin Yoga can be helpful to slowly regain our hips natural range of motion. However, it is important to review our life connection here as well. 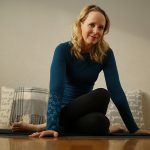 1 hour in a yin yoga class can help provide some relief for the 8 hours we spend sitting at a desk at our jobs, the 2 hours we commute back and forth to work, the 2 hours we spend lounging on the couch and the hopefully 8 hours we spend sleeping at night. However, that is 20 hours of immobility for your hips. It is necessary to sit on the ground when we can, move around and reflect on how we can move our hip joints through their full range of motion during our days. Hip openers attend to our liver and gallbladder meridians, which can attend to the emotions of anger, irritation, annoyance and frustration. To be able to sit for long periods of time in meditation that is undisturbed by physical complaints requires a body that is open especially in the hips and low back, which requires a dedicated yin yoga practice. Let me know in the comments, did you become aware of bone on bone compression in your hip joints today that you were not aware of before? If so does that change your yoga practice? Opening your hips is not something you can do in just one yoga video. Just like brushing your teeth, yin yoga and opening your hips is a way of life and is something you can embrace everyday. The best way I have learned to care embrace the yin way of life is to make yoga a part of my everyday life. I am going to share with you a good, better and best way to do that now. Best: The best way to make yin yoga a part of your everyday life is to join our membership community. It is there that we can support you in making yoga a part of your daily life with our curated content. We have our monthly YinDulgence 90 minute LIVE workshops with 2 way videos on the last Sunday of every month at 9:30 am and 4:00 pm PT, with archives recordings made available to our members afterwards. We also have over 20 value added classes in our membership community for hips. Previous post: What Yin Yoga is Best for Lower Back Pain?